Pre-heat the oven to 180°C/gas 4. Grease and line a round 15cm/6" loose bottom cake tin. ? Add the grated zest of lemons and yogurt then add the eggs. Add the flour, mix well and spoon the mixture into the prepared tin, ensure a level surface.? Bake in the oven for 35 minutes or until golden brown or until a skewer comes out clean. Transfer to a cooling wire.? In a small saucepan add the juice of the lemons with the remaining 3 tablespoons of sugar and allow to reduce on a high heat. Leave to cool slightly.? 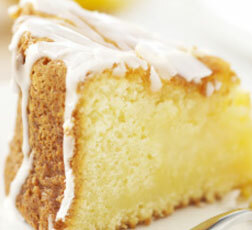 Using a skewer or cocktail stick prick the cake all over and then pour the lemon sugar syrup all over the top, allow it to soak in.? Leave to cool completely before icing.? Mix the icing sugar with the water until a runny paste consistency is achieved. Using a spoon drizzle the icing liberally backwards and forwards over the cake.